Kaitlin Howard is a Coliseum pantomime favourite – she played The Slave of the Ring in last year’s Aladdin and this Christmas will be playing Fairy Feathers in Mother Goose. Before Christmas season begins though, Kaitlin will be reprising her award-winning role as The Alphabet Girl, which comes to the Coliseum Studio from Tuesday 15 – Saturday 19 September following a run at the Edinburgh Fringe Festival. We sat down with Kaitlin for a chat about The Alphabet Girl before she heads north of the border. What is the atmosphere like at the Fringe? I’ve been to the Edinburgh Fringe twice before, both times with shows and it is such an amazing experience. The whole city is teeming with all sorts of performers, artists, musicians, street artists… all eager to show what they can do, and also those there to soak it all up and enjoy being entertained. It seems such a cliché to say that the atmosphere is ‘electric’ but it truly is and I wholeheartedly recommend people go to the Fringe. If you perform then go to perform, if you love to see art in any form then go to see and experience it. Every nook and cranny is packed with the weird and the wonderful and in my opinion if you love theatre, the sheer volume of it (and the amount of like minded folk all there with the same love and aim) in what can often be very unexpected spaces, proves it to be a brilliant place to tickle that fancy. You play three generations of characters in The Alphabet Girl, which is your favourite? All three of the women in The Alphabet Girl have their own distinct personalities, their own hopes and dreams, particular and quite often peculiar idiosyncrasies. They each also present very different challenges for me as an actress. As a performer who has three characters to produce in quick succession, with very little in the way of costume changes, it is important that the obvious things are covered to make it clear to the audience that “I am now playing someone new”, e.g. the voice, the physicality, the speech rhythms, the gestures used etc. However, they are all members of the same family so there must also be echoes and clues in each performance that tie them together. That’s the fun part, finding what those are and anchoring each woman in what is real. 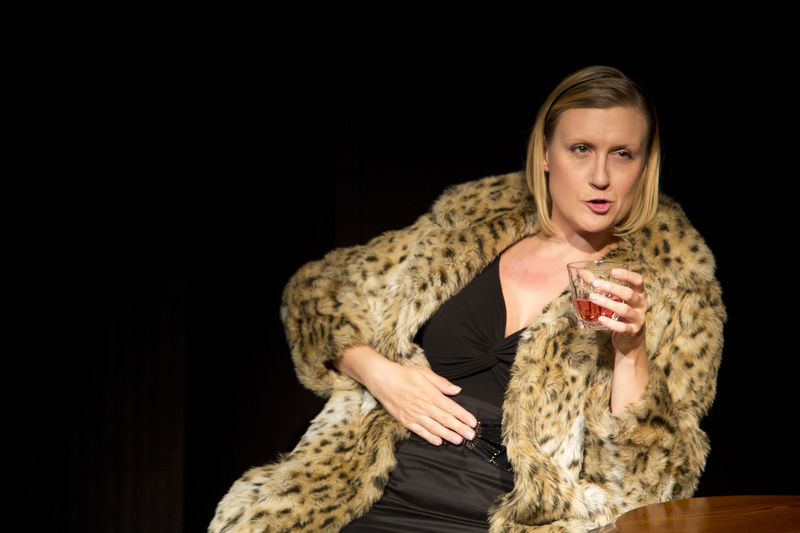 What is it like performing a one-woman show? Is it any more or less nerve racking or exciting than as part of a bigger cast? Usually I am not a performer who gets overwrought with nerves. Yes, I get butterflies and jittery before the first show, but this is because it’s the first time the final element of a true audience reaction is added to a production. I always looked at actual performances as part of the process, as part of the job, something to be enjoyed as much as rehearsals – it’s when a lot of the real “playing” starts. One of the main points of putting on a show is to do it in front of an audience, so it was never a big terror to me and it was always something I loved. When we did The Alphabet Girl the first time round it was SO different! Don’t misunderstand, I still loved every second of it, but it was utterly terrifying! Firstly, it was a new play and none of us knew if it would be received well just on that fact alone. Secondly, I’ve been a professional actress for twelve years but it was the first time I had undertaken a play where it would be only me onstage for the whole show. This puts any performer under a lot of pressure as they have no other performer to interact with, to play with, to listen to. There’s no one to help you. All eyes are on you. The concentration needed is huge. In any show, with any size cast, these interactions and concentrations are all paramount, but when you are alone it is magnified a thousand fold because you are under the audience’s microscope. I was honestly so very nervous, every time I did the show, and because I had no one else to help me I had to stay so alert for the entire performance. I could not relax, especially as the script is full of some very tricky tongue twisters and poetic phrases. Beautiful language, but so easy to trip over if you are not completely in the moment. But this is the amazing thing I’ve realised this time round – despite it being easy to feel that you are alone, you are not. In The Alphabet Girl I have the audience to interact with, the audience to play with, to listen to. They are there to help me and they want it to go well else they wouldn’t have bought a ticket. This time round, despite the fact that I will still be nervous, I know this time that it works and it was loved by people last time. These are the wave I will ride and hopefully we can all relax and enjoy it together. 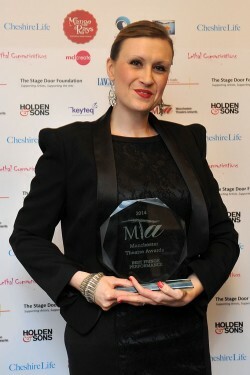 How did it feel to win a Manchester Theatre Award for your performance at The Alphabet Girl’s premiere? I didn’t know about the nomination until it was announced in the paper, and even then I found out only when our brilliant stage manager, Liam, text me with a very simple “Congratulations!” My response was understandably confused. Once I realised what he was talking about I couldn’t wipe the smile off my face – It was so lovely to be put into a group of other wonderful actors and actresses who had done such good work that the MTA’s wanted to recognise us with the nomination. That honestly was such a lovely feeling all on its own, but then when I actually heard my name read out as the winner of Best Fringe Performance I felt so many other things too. I was happily shocked, humbled, elated and many many more wonderful adjectives. It’s certainly been a confidence booster and allowed me to have faith in my abilities and also made it possible for us to take this show further. The attention it has drawn to the show and to me as a performer has been very positive and incredibly warm. Has the show changed since its premier in 2014? There were a few practicalities which the writer, Renny Krupinski, needed to address in that Ivy’s segment is set in the very moment that the audience is observing. This meant that certain dates needed changing so that the story arc still made sense. We also sat and talked about things that perhaps had not quite got the audience response we’d expected or hoped for and how that might be rectified. Hindsight is always a really helpful tool in revisiting anything you decide to do again and Renny is a great believer in chucking out stuff that doesn’t work and leaving the things that are right. Having said this, very little in the writing (other than a few tweaks) is different and now we are having fun playing with any ideas we’ve had about what makes these women tick. It was pretty much on the button last time, but it never hurts to double check. Do you have time in Edinburgh to see any other shows at the Fringe? If so, what would you like to see and why? I am performing at 5:10pm daily (except 16th and 23rd August) for the entire festival. The show runs for 1 hour 10 mins and my venue is very central. This means that I will have time in the day and in the evening to see things. I think I will take it easy to start with and see what time the butterflies kick in. I like to have a clear mind and to be able to concentrate on what I will need to be doing on stage myself, so I certainly can’t cut it fine to get to my venue and set up. I do have a few things I want to see and with a couple of days off it helps me see the shows that are on at a similar time to me too. There’s two other one-woman shows that I’m eager to get to and both are incidentally being performed by really good friends of mine. I think we might have to start a club! There’s Mata Hari: Female Spy at Zoo, and Man To Man at The Underbelly. Also Weekend Rockstars at The Underbelly and Crusoe at Zoo are there with companies and people I know so I shall go to see them. I think it’s so important to support those you know, especially in the magical mayhem that is Edinburgh. Other than that I love being guided by word of mouth and what people I meet recommend once I’m up there. The brochure is packed and, as much as I might want to, I’m not going to make it to everything and have to narrow it down somehow. You played the Slave of the Ring in last year’s pantomime and will be returning as Fairy Feathers for Mother Goose this Christmas – how different is pantomime to drama acting? Pantomime is an art form all of it’s own and I know that in Oldham there is a close connection between the Coliseum and the local community through it’s traditional family panto… and I loved being a part of that last year in Aladdin. I was so touched when I was asked back and am already excited to be returning as Fairy again, a feeling which I’m sure will increase as the year goes on and I’ll have to rein in before I go into rehearsals else I’ll just turn into a hyperventilating kid in a sweet shop! I was brought up on pantomime. My mum played principal boy in her youth and then wicked step mums and fairies. I too have played principal boys in the past, but as I’m now a bit older all I want is my big frock and a sparkly wand! I love the silly comedy, the colours, the big performance style, the music, the dancing… However, I’m sure the resident experts, Kevin Shaw and Fine Time Fontayne, will back me up when I say that it is not just all glitter, slop scenes and cross dressing lead actors. 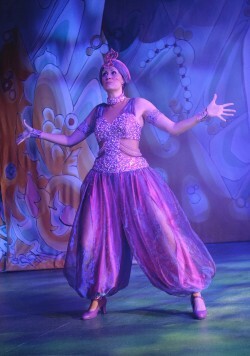 I think panto is about team work and a connection to the audience. You need to work together closely onstage, you need to listen to everyone in the room, have a strong sense of play, time things perfectly, be truthful to the part you play in the jigsaw, have no ego and wish to include and entertain the audience… None of which is different to anything you should do onstage be it drama, comedy, song or dance. What are you looking forward to most about performing The Alphabet Girl at the Coliseum in September? Being at the Coliseum full stop is a massive draw for me. It is such a wonderful theatre, with a fantastic team behind it and so brilliantly supported by all the people who attend the shows. As someone who is not originally from the area, to have moved here and lived here for the last five years and to have been welcomed so warmly into the “family” at the Coliseum is such a lovely reward. Kevin Shaw saw The Alphabet Girl in its original run last year and for him to have offered us a space in the programme at the Coliseum, and on top of that pretty much open up and create a Studio Season to accommodate it, just shows how much the hard work put into it was worth it. I really hope that when people come to see the show they enjoy it and it not only expands what the Coliseum already offers to its loyal audience, but it also paves the way for more studio work. I believe the more performers on the go, on as many stages as possible, the better! The Alphabet Girl is runs at the Coliseum in the Studio from Tuesday 15 – Saturday 19 September. Book now. Tickets start at £10 (£6 for under 26s) .